Apple's Beats Music service has been praised for its experience on mobile devices, but the same can't be said of its Web-based player. 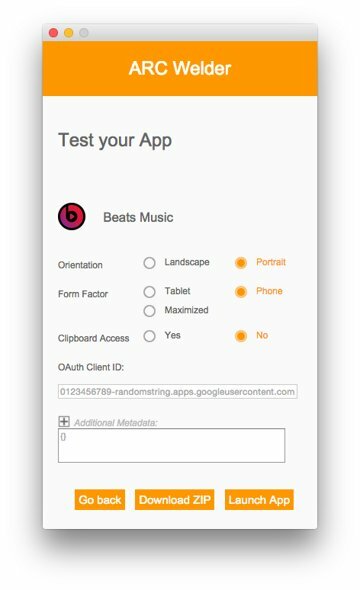 Fortunately, there's an easy way to get the Beats Music Android app running on your Mac. The Beats web client has some notable shortcomings: it uses Flash for the player, and many users find that it stops responding often and at seemingly random intervals. It also lacks access to Beats Music's famous The Sentence feature and runs in a browser window, which means it can be difficult to hunt down if you have lots of tabs or windows open. We can fix almost all of these issues by using Google's App Runtime for Chrome (ARC) to run Beats Music's Android app almost like a native Mac app, complete with its own tileable window and an entry in the application switcher. Note: Before you get started, you'll need to acquire a copy of the Beats Music Android APK (application package). If you use an Android phone or tablet, you can copy the APK from your device using an app like APK Extractor from Google Play. If you don't have an Android device, you'll have to grab the APK in another way— because that's not an entirely above-board process, we'll leave it as an exercise for the reader, but there are a number of websites and Chrome extensions that make it easy. Because Google designed ARC primarily for Chrome OS, the runtime relies on a local installation of the Chrome browser on OS X Machines. Chrome is available as a free download from Google— install it as you would any normal Mac app, then open the browser and follow the on-screen prompts to configure it for the first time. ARC Welder is a Chrome extension that helps prepare APKs to run under ARC. Just click "Install" on ARC Welder's page in the Chrome Web Store, and Chrome will download, install, and configure it automatically. 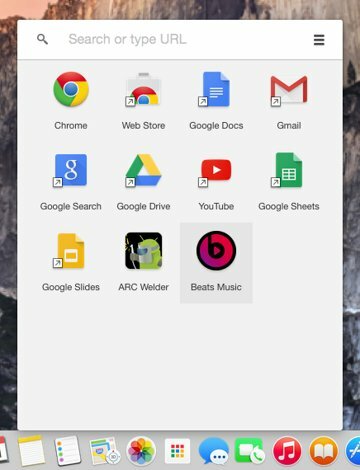 If ARC Welder is the first Chrome app you've used, installing it will also put the Chrome App Launcher in the dock —you'll be able to launch Beats Music from here when we're done. If you prefer, you can remove the Chrome App Launcher from the dock and access your installed apps via Chrome's Bookmarks bar instead. Once everything is installed, launch ARC Welder from the Chrome App Launcher. The first thing it will ask you to do is choose a location for it to use as a file store —we chose to create an ARC Welder folder inside our ~/Documents directory, but you can pick any location that you so desire. On the next screen, click "Add your APK" and select the Beats Music APK that you downloaded earlier (it should be called com.beatsmusic.android.client.apk). ARC Welder will analyze the file, and then present you with a number of options for the app environment, like device orientation and form factor. We recommend changing the "Orientation" setting to "Portrait," choosing "Phone" as the form factor, and disabling clipboard access; you can leave the "OAuth Client ID" and "Additional Metadata" fields blank. When you're ready, click "Launch App"— after a few software gyrations, you should see the app pop up in its own window. 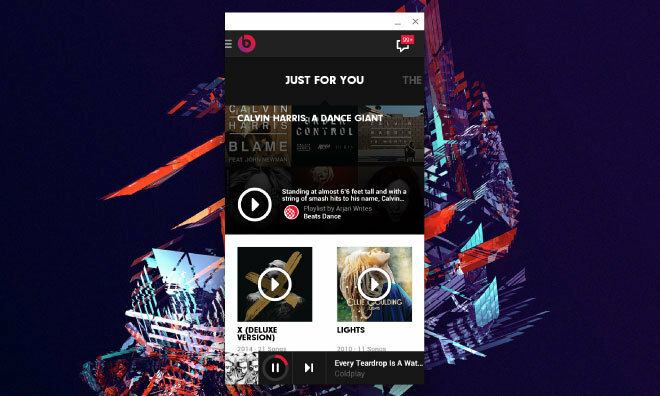 Now, just log in with your existing Beats Music credentials and you're good to go. If you want to experiment with different options in ARC Welder— form factors or orientations— just keep it open after clicking "Launch App." You can change settings and re-launch the app as many times as you want, and simply close ARC Welder when you're done. The Beats Music app will retain the most recent settings. Chrome comes with a built-in notification server, and by default Beats Music will overwhelm you with blank notifications. 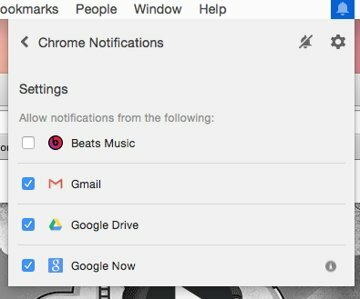 You can disable Beats notifications by clicking the Chrome notifications icon in the menu bar (a bell), then clicking the gear in the top-right corner and unticking the box next to Beats Music. You can hide (or show) the notifications icon from the Chrome menu. Also, take note that Chrome must be running for the Beats Music app to work, though you don't need to have any browser windows open. If you try to launch the app while Chrome is closed, it will spawn a Chrome process before opening the app.